This is Alex’s Island Sunrise quilt and she choose bright bold batiks for this project. I had a lot of fun quilting it as she said she wanted bright coloured threads and lots of quilting. I used a variegated Lava thread in bold colors on the top and a purple So Fine for the back. All the designs are free hand and I didn’t have to stitch in the ditch. I did a leafy feather in the outer border and three wavy lines in the inner border. Loops and curls fill the background and a leafy design in the spikes to make them look more like a tropical flower. Alex brought me a beige tone and tone backing and I asked if she wanted me to dye it darker to blend more with the top. She liked that idea and said purple was her favourite colour! So long ice rink, you served me well this year but I’m ready for spring! Here is the latest Curve it Up block, the Drunkards Path. I am now out of background fabric so will have to try to dye some more fabric to go with what I originally dyed, good thing I wrote down the recipe. Hope I can recreate this color! This is Sheri’s cute gray and pink quilt and the pattern is called Box Step . 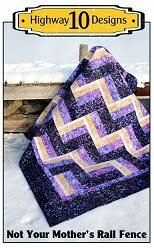 This quilt is the same as the last one I posted and it is amazing how different they look done in different fabrics. I quilting free hand feather swirls and it shows up nicely on the gray Minkee backing. Light pink So Fine thread on top and gray Bottom Line on the back. Robin brought me this fun Black, Yellow and White quilt top to finish for her and the pattern is called Box Step by Cozy Quilt Designs. The blocks are quite large so I used a new panto called Dazzle by Hermoine Agee which is a larger scale design. I've been waiting for just the right quilt to use this panto on as purchased it about 6 months ago. The Dazzle design is similar to the Spiral Squares panto but has more of a curved diamond shape to it. I added a soft curved texture to the quilt. The quilting shows up great on the light backing. I used a medium grey So Fine thread on top and a off white Bottom Line on the back. This is Lynette’s Wild Rose Cottage quilt and it was a Block of the Month project. Lynette asked for moderately spaced quilting and I think I achieved that balance with just enough detail to give the quilt texture with some interesting elements. She was very kind and said I didn’t have to SID around the fence but could do a meandering vine design so I did loops and a tiny flower which matches the print on the green fabric. I did the bead board design in the outer border in a medium green thread. 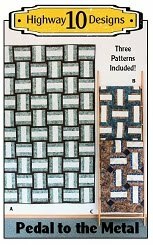 I use to believe that you had to match the thread color to the background color when quilting on large print fabrics but the green looked so much better than black. So that was a good reminder that there are really no hard fast rules when it comes to quilting just guide lines and its best to go with your gut instinct! I used Quilters Dream Blend batting, four different colors of So Fine on the top and off white Bottom Line on the backing. Lynette said I could play in the center block and I liked the idea of swirls in the sky but I tried not to repeat the same style of swirl to make it more random. I kept wanting to do my 3’s and E’s but was able to get out of the habit and change up the direction. I was also asked if I could quilt a dog in the grass, I love added personal touches like that to a quilt and think that turned out well. Here is the next block in the Curve it Up QAL. 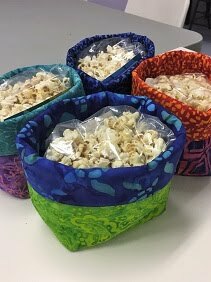 You can find the instructions on Jenny’s blog here. Woke up to –31’c this morning…. Mother Nature has a wicked sense of humour!! I’m so ready for spring! Debbie also sent me two cute baby quilts to finish for her. The first one is called Mojave by Villa Rosa Designs and she made hers in bright primary colours for a boy. We decided on my 3’s and E’s free hand design as it is an open design and will keep the quilt soft. The backing is this bright blue Minkee which makes this such a cuddly quilt. 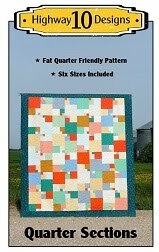 The second quilt is from the pattern Cheaper By the 1/2 Dozen, designed by Legacy Patterns. Debbie did her quilt in soft neutral greens and yellows. I knew right away which panto design I wanted to put on this one, Goldfish! The fabrics have a bubble design which look like water bubbles as well as the green fabrics have a fish scale pattern. The backing is soft yellow Minkee and shows off the fish nicely. This is Debbie’s quilt and the pattern is Sewn in Time by Lynne Wilson. It is a great lap quilt made with Fireside fabric for the backing which is the softest fabrics EVER! I have a quilt that I throw on my bed in the winter that is made with Fireside and it keeps me so warm. I chose the Tickle panto for this one to keep the quilting light and the curves compliment the piecing. Quilters Dream Blend batting and So Fine green thread on top and brown Bottom Line on the back. This picture below reminds me of a cute story I want to share with you. I had a reader email me saying that her husband thought my pictures on the ice were Photoshopped! Looking at this picture below which is at an angle I like to use a lot, as the quilt looks like it is floating, I can see why he would think that. She tried to convince him they were not but he is a graphic designer and was sure they were. So I sent them a bunch of picture showing the ice patch is in front of my house and of my son and I sitting in the snow bank of the ice patch, etc. Yes this ice is really out my door and I've worked hard to keep it crystal clear all winter. I also don’t have time to Photoshop my pictures and as a friend said “why would you Photoshop something that you have access too?” I took this as a huge compliment to my photo skills and my beautiful surroundings. I also know that many people have not experienced living in this cold environment and it is hard to image that it can be this beautiful. I wonder if he believes me now or if anyone else thought that too? Here is the ice and my house, you can see how beautiful the ice can be when the sun shines on it. No need to Photoshop, honest! Every once in awhile I quilt a client quilt that I really don’t want to give back, this is one of them! 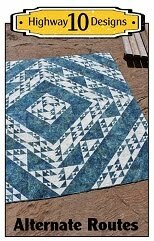 I love the batik fabrics and the pieced pattern which is called Aegean Sea and it can be found in the book Stellar Quilts by Judy Martin. When I put a lot of thought and work into the quilting designs I feel a bit of ownership to it even thought I know it has to be mailed back to it owner. And the owner of this quilt is the daughter of my client Gail who sent me the last two quilts I posted. Looks like she learned the art of quilting very well from her mom! I was asked to quilt it just like in the book but I like to be a bit more creative and put my own interpretation into the quilting so was given the go ahead to change it up. In the open spaces I created a feather wreath around a pumpkin seed design in two circles. Here is a picture of how it was quilted in the book, you can see I used the pumpkin seed design and the extended feathers from the wreath but changed up the shape of the wreath and filled in more to create more texture and balance. I repeated the pumpkin seed design in the star blocks, the book only had that design in the center square of the star but I continued and carried it into the background squares to really tie it into the feathered wreath design. 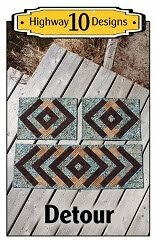 I SID around all the Greek key pieced designs and added loops in the inner and outer border. Its a large quilt, 99”x99” and covered most of what is left of my ice patch!